One of the highlights at ITMA 2015 in Milan was KARL MAYER’s presentation. This well-known manufacturer was showing its products on a stand covering an area of 1,200 m² over two levels. This company was showing nine ground-breaking machines and nine new developments for the textile and services sectors. The exhibits were staged extremely effectively in a futuristic setting. A multimedia show and curved, organic shapes covered with textiles were visible from some distance away, and invited visitors to take a look into the future. “Impressive”, “spectacular” and “totally visionary” were just some of the words used by the visitors to describe the stand. As soon as the fair opened, this was the stand that everyone was talking about and it quickly became a crowded meeting point for the sector. 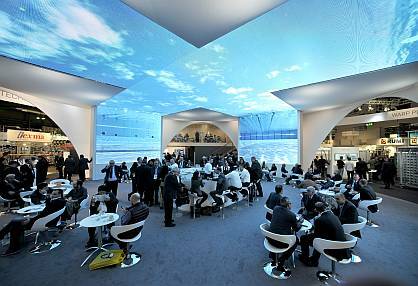 By the time ITMA was over, KARL MAYER’s exhibition team had recorded roughly 1,650 conversations. Most of the visitors – just over 26% - came from India. The team was also able to welcome many existing customers and newcomers from Italy (roughly 11%), Turkey (roughly 7%), and Germany and the USA (about 4% each). In addition to the large number of visitors, KARL MAYER’s representatives were impressed by the high quality of the discussions they had. During the conversations, the guests asked many specific questions on the technology and end-uses. A number of projects involving first-time or continuing cooperation were planned, and sales contracts were initiated. KARL MAYER’s new HKS 2-SE machine presents a multitude of innovations: a novel machine design, KAMCOS® 2 as a new automation platform, integrated monitoring functions with the new camera system and - with the Low Energy Option (LEO) - a very efficient means for cost saving. Moreover, the HKS 4-M EL with its high productivity and maximum flexibility was another highlight during the trade fair – especially in combination with KARL MAYER’s DS OPTO-EC intended for the efficient manufacture of patterned sectional beams. At the machine show, the HKS 4-M EL was running at a speed of 2,100 min-1 and, despite its high dynamics, was operating with a high degree of precision. At maximum speeds, the shog movement for the underlap is executed precisely in just 6.3 ms. What is more, the extensive patterning potential of this new machine, which is the result of the EL function, is extremely impressive. For the lace sector KARL MAYER was able to offer the most suitable product for every requirement: Whereas the new TL 79/1/36 FASHION is designed to produce high-end lace articles featuring relief-like patterns, thus, being of special interest to lace manufacturers of the premium segment, the highly productive MLF 46/24 machine attracted the attention of the mass producers. The extra-wide MULTI-MATIC® was one of the exhibits of the KARL MAYER Business Unit Warp Preparation that attracted a great deal of attention. With a working width of 3,600 mm, the new MM 128/3.600 is 1,350 mm longer that its predecessor for the same number of yarns processed. Another highlight was the VSB Size Box, which is as good-looking as it is functional. The key element of the PRO SIZE® sizing machine offers numerous advantages in terms of process efficiency and quality. In the sectional warping machine sector, KARL MAYER was showing a study in concept and design in the shape of the PRO WARP®, which is an extremely flexible machine. This new machine combines the “best of” technologies of the OPT-O-MATIC and the ERGOTEC. The standard machine is a good all-round machine, but it can be expanded to create a specialist machine to suit specific customer requirements. KARL MAYER was also showing an innovative system for the denim sector: a dyebath featuring the Double Vario technology as a key component of the PRODYE denim dyeing machine. The Business Unit Technical Textiles showed a new machine featuring KARL MAYER’s modern corporate design: the WEFTTRONIC® HKS. The next generation of the HKS MSUS was running at a speed of 1,500 min-1 during the fair and was equipped with a needle gauge of E 40, which is something new for the technical textiles sector. The machine was processing a yarn having a count of dtex 33 to produce an interlining that was lighter and more flexible than any interlining ever produced before. In addition to its product repertoire, the WEFTTRONIC® HKS was impressing people with its quiet, accurate running. In addition to its new technical developments, KARL MAYER was also showing some pioneering online systems designed to make life easier for its customers. For example, the new KARL MAYER CONNECT app provides a quick link to the manufacturer for sending out service requests, and the customer benefits from faultless, efficient communication with the manufacturer. This app works with a QR code. This is scanned in via a mobile phone or tablet at the operator interface of the machine and displays important machine data. KARL MAYER also provides more support with obtaining spare parts – in the shape of the SPARE PARTS WEBSHOP platform and the KARL MAYER CHECK PARTS app. About 1,500 wearing parts for all the current warp knitting machines can be ordered directly from the webshop, just by clicking on the mouse. For other spare parts, the webshop offers an easy-to-use request function via online access to the electronic spares catalogue for machines built from 2006 onwards. Once the spare part arrives with the customer, it can be checked to ensure that it is not a copy using the new KARL MAYER CHECK PARTS app and a QR code. This digital element is a feature of the new seal of authenticity. After scanning, the QR code provides the information on the quality status. If there is any doubt about the origin, a report, together with a photo, can be sent to KARL MAYER via a simple menu navigation system.